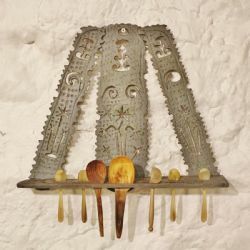 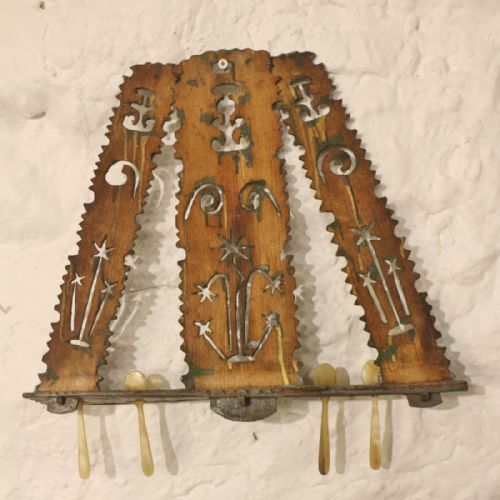 A SUPERB CHIP CARVED SPOON RACK RETAINING LAYERS OF POLYCHROME PAINT WORK, ELABORATE PIERCED CARVING DECORATING THE THREE SHAPED UPRIGHT SUPPORTS, LOWER SUPPORT RACK WITH TWO ROWS FOR HOLDING SPOONS AND UTENSILS, OF PEGGED CONSTRUCTION. 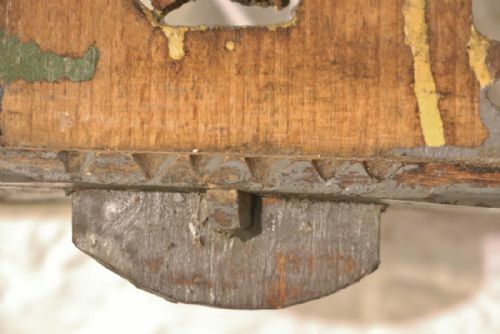 THE REAR WITH ORIGINAL EXPOSED HARDWOOD(BEECH/SYCAMORE), MINOR CHIP TO RIGHT SIDE CARVING (SEE PHOTO) OBVIOUS AGE BUT STRUCTURALLY SOUND NO WORM. 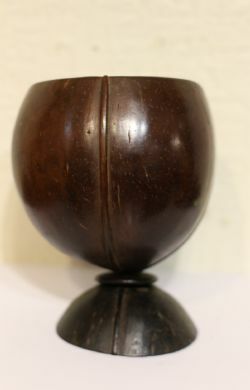 IN BOUGHT AS SEEN CONDITION FROM A PRIVATE COLLECTION. 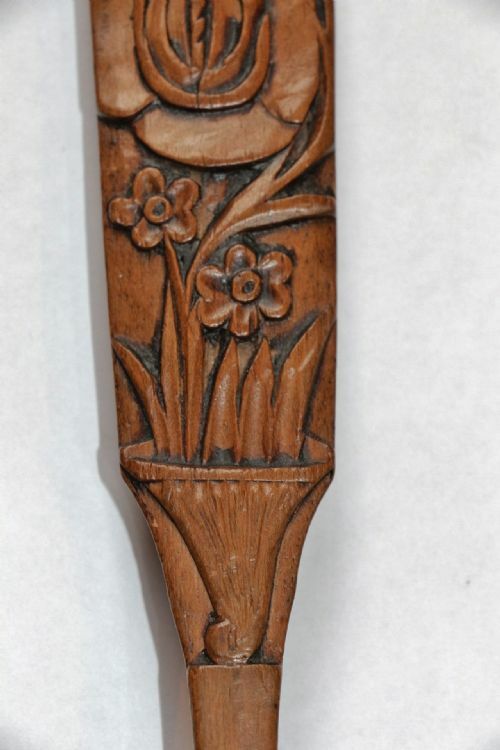 LOVELY ORIGINAL PIECE OF FOLK ART. 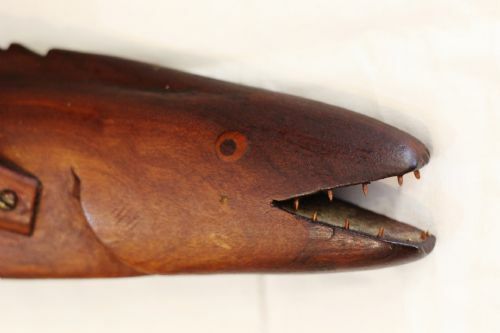 A WONDERFUL EXAMPLE OF A LARGE CARVED WOOD FLYING FISH FROM PITCAIRN ISLAND IN THE REMOTE CENTRAL PACIFIC OCEAN (ONCE REFUGE OF INFAMOUS 'THE BOUNTY ' MUTINEERS IN THE 18TH CENTURY,). 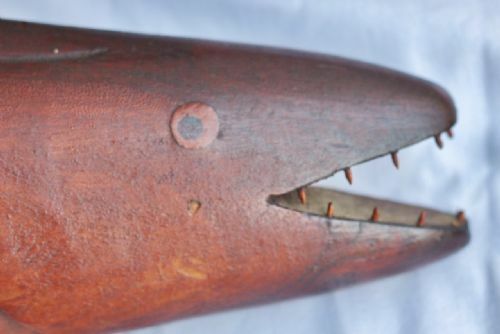 BEAUTIFULLY CURVED SHAPED TORSO WITH INSET INLAID EYES AND SHARP TEETH, APPLIED FLYING FIN WITH BRASS SCREW, THE REVERSE STAMPED PITCAIRN ISLAND. 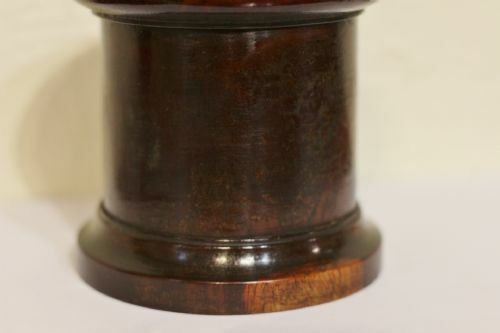 NICE FIGURED TIMBER AND OLD AMBER VARNISH PATINA. 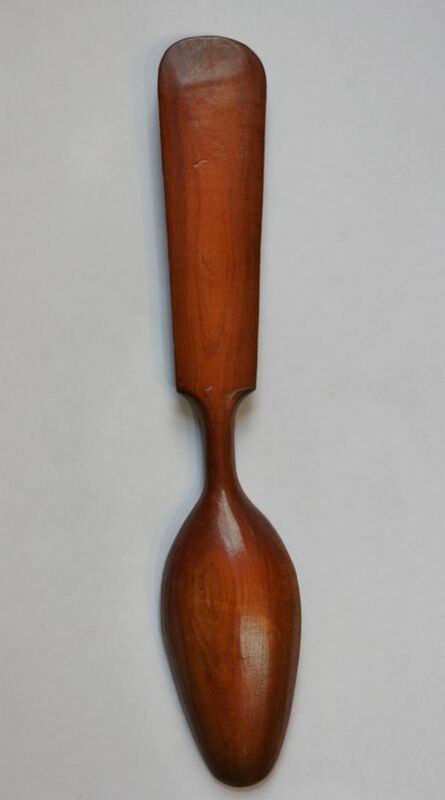 OLD HOOK TO THE REVERSE,NICE DECORATIVE PIECE LOOKS SUPERB 'IN FLIGHT ON THE WALL..
UNTOUCHED ORIGINAL CONDITION,WONDERFUL RICH COLOUR AND PATINATION, WITH UNUSUAL MUSHROOM SHAPED SCREW TOP, TURNED FROM DENSE FIGURED LIGNUM VITAE TIMBER, NICE GENTLE WEAR THROUGHOUT. 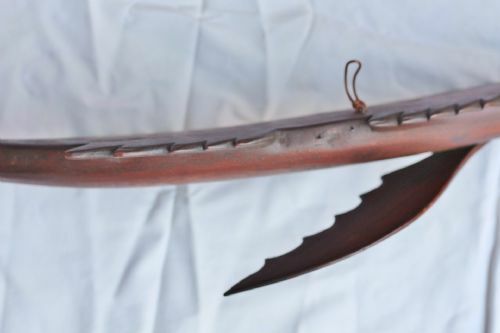 BOUGHT PRIVATELY. 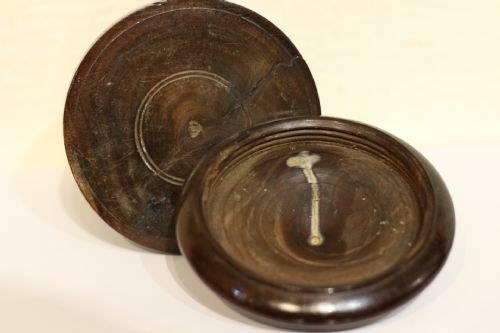 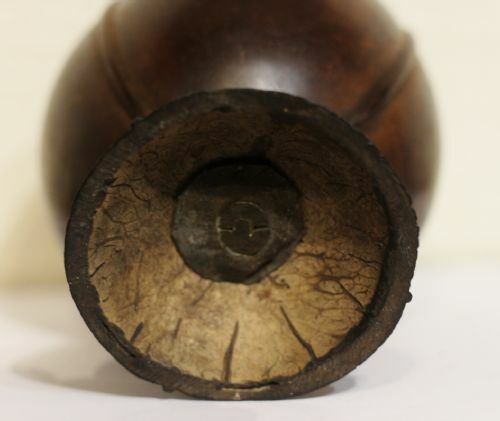 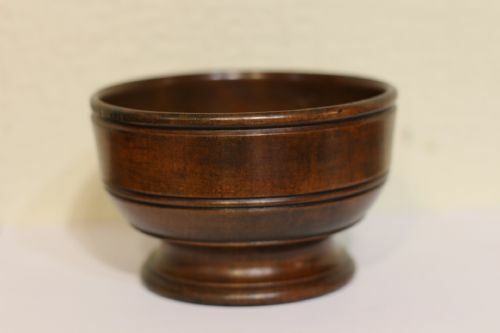 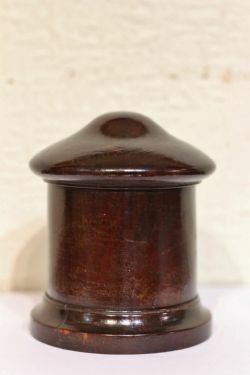 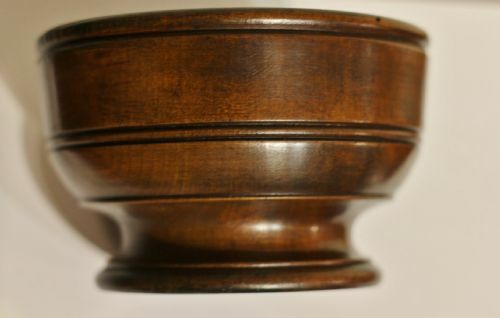 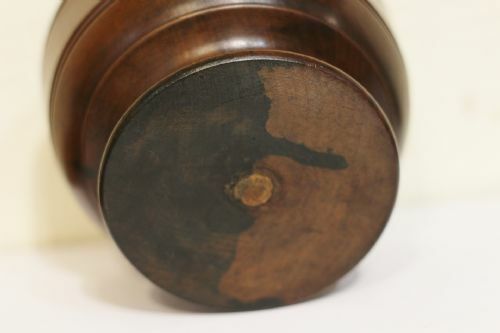 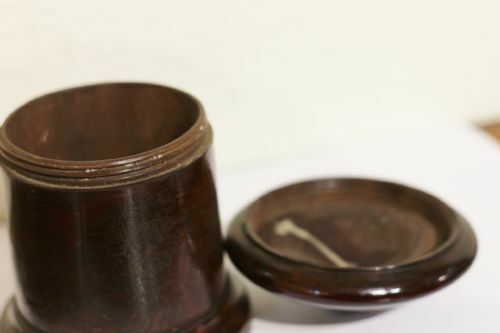 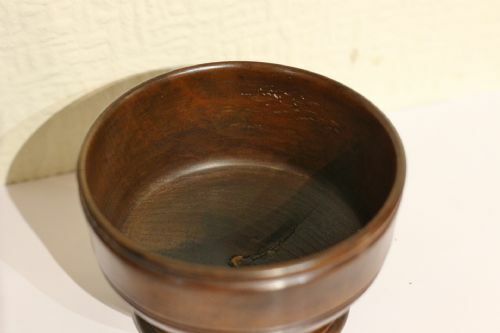 A LOVELY HONEST EARLY 19TH CENTURY FRUITWOOD SALT,LIKELY APPLE WOOD- WITH UPPER RIM & CENTRAL DECORATIVE RING. 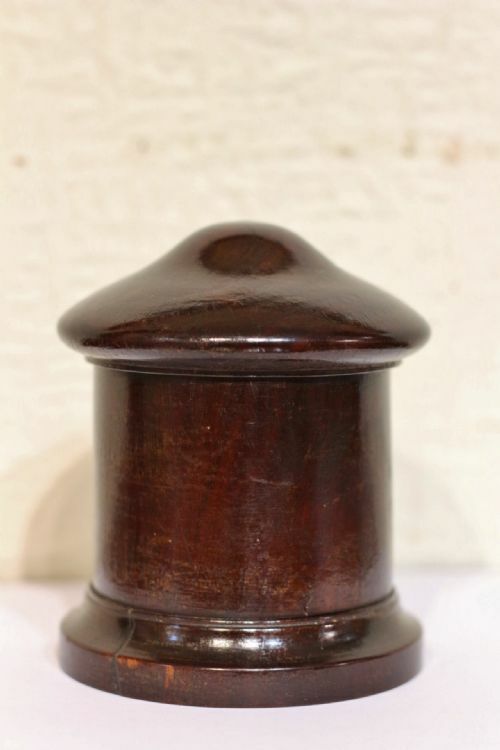 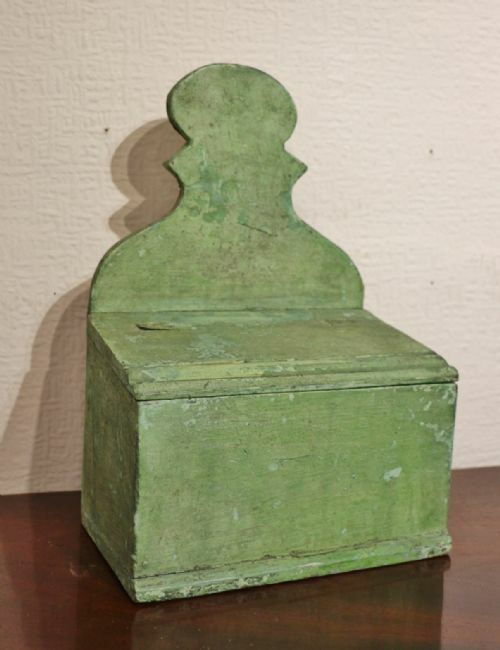 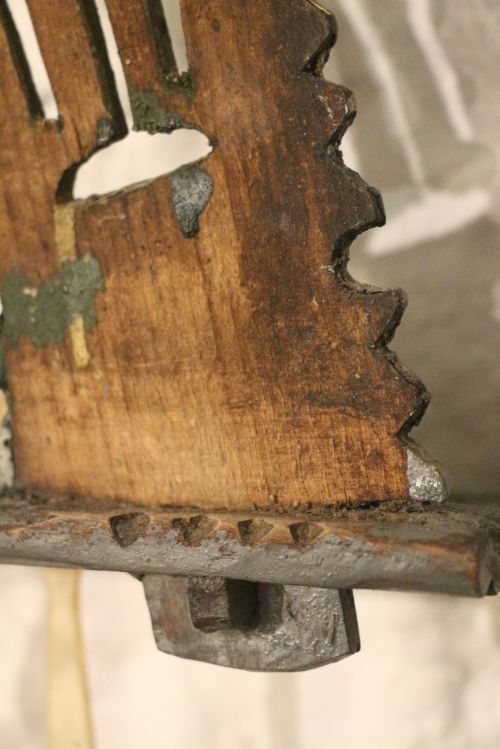 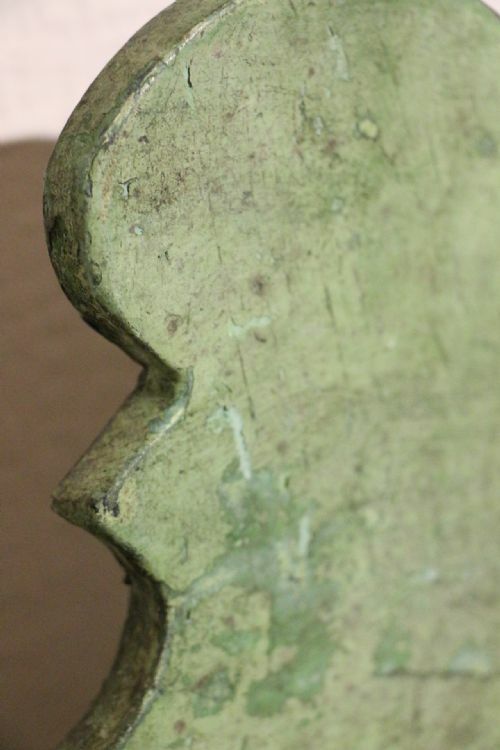 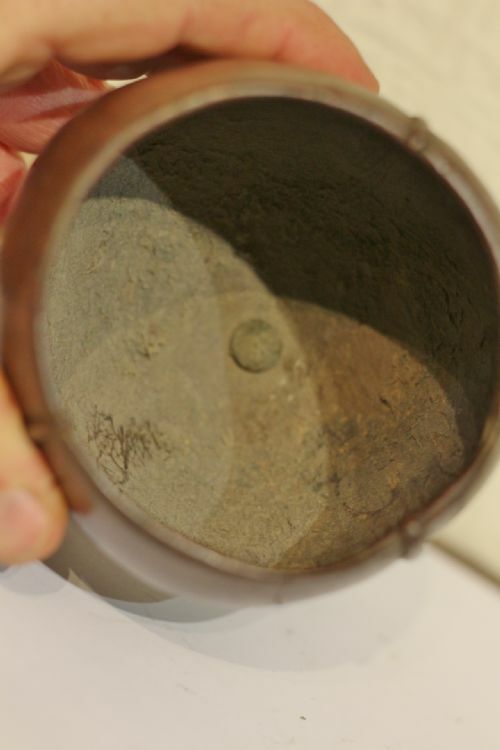 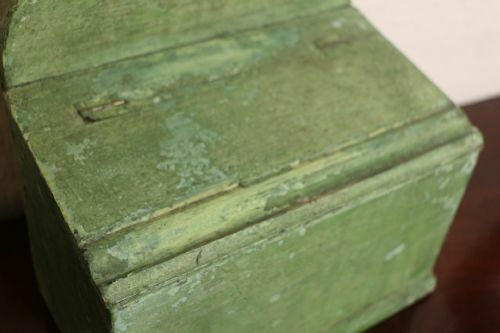 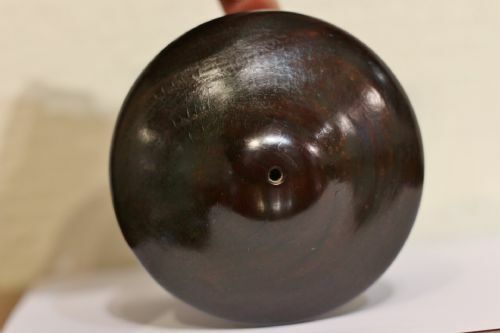 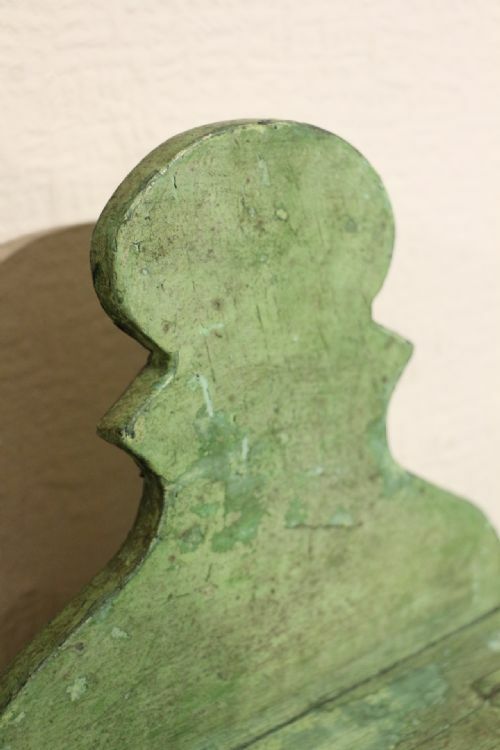 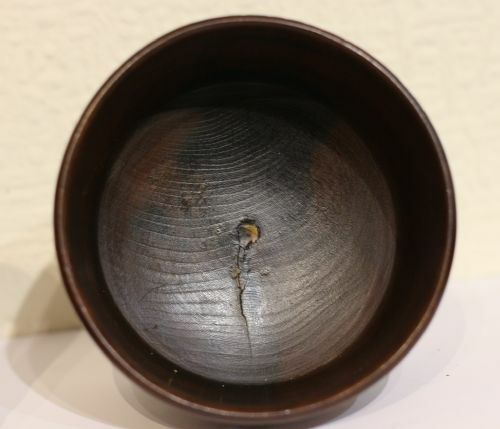 A PIECE SUCH AS THIS WOULD HAVE BEEN USED TO HOLD SALT IN THE DOMESTIC SETTING OF HOUSEHOLD.LOVELY RICH COLOUR AND PATINATION, HOLE WHERE LATER HANDLE POSSIBLY PLACED NOW REMOVED OR POSSIBLY A LOOSENED TWIG KNOT IN THE TIMBER. 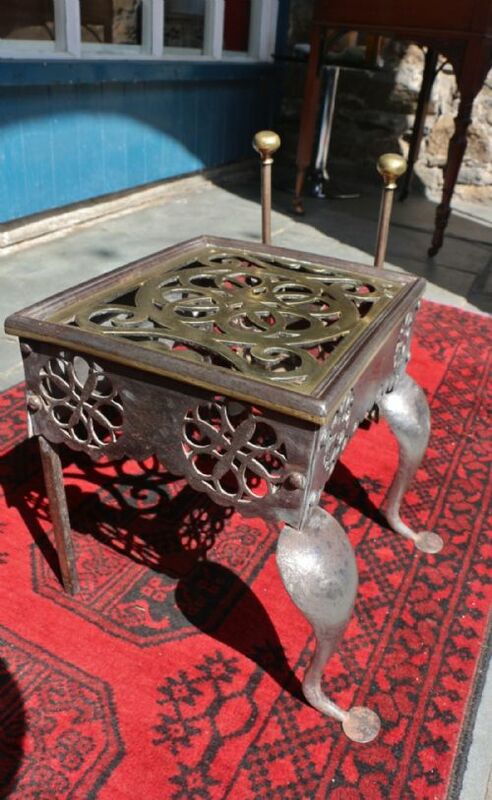 BOUGHT PRIVATELY. 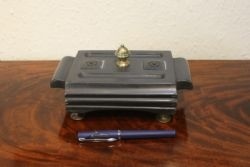 AN UNUSUAL 19TH CENTURY WELSH FOLK ART HAND CRAFTED INKWELL WITH SHAPED REMOVABLE LIDS FOR THE INKWELLS, LARGE SOLID BRASS CARRYING HANDLE FINIAL WITH BRASS PAD FEET. 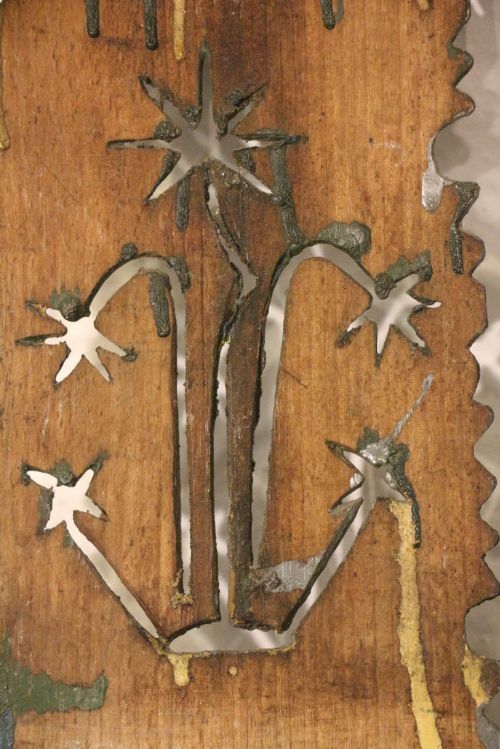 (SLATE FOLK ART LIKE THIS WAS OFTEN MADE BY THE QUARRYMEN OF THE SLATE QUARRIES OF WALES AS GIFTS OR AS AN ADDITIONAL SOURCE OF INCOME). 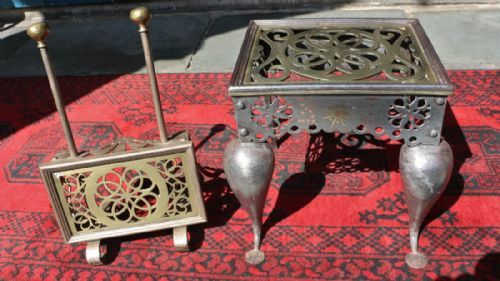 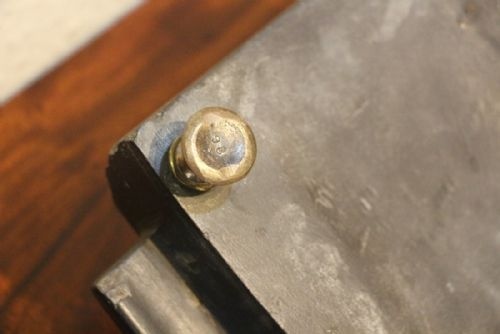 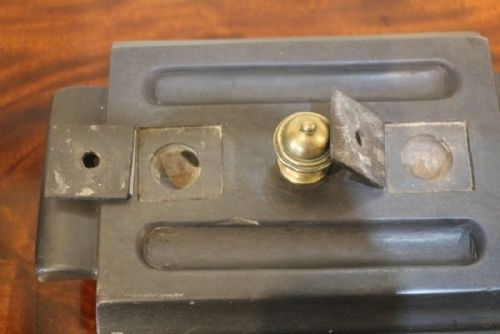 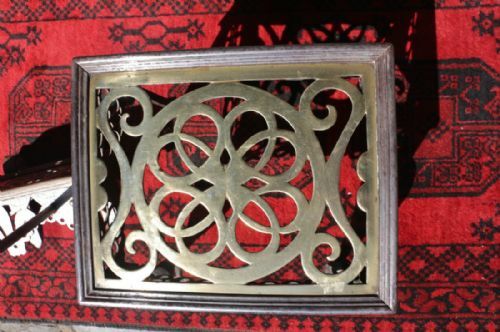 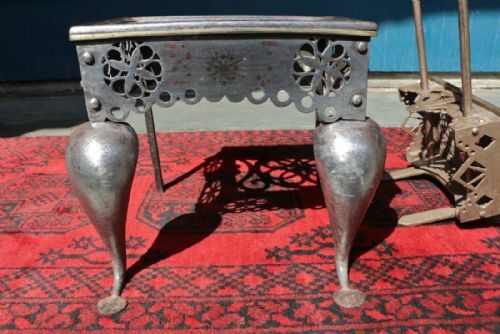 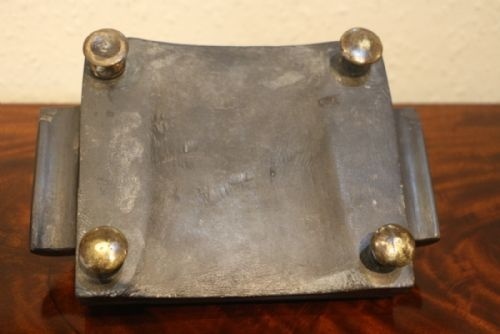 SUPERB EXAMPLE OF A PIERCED BRASS & IRON FOOTMAN & ADJUSTABLE TRIVET, EVEN INITIALED 'B-J'. 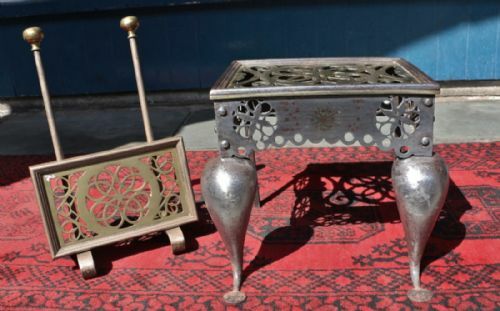 BOTH IN CLEANED CONDITION. 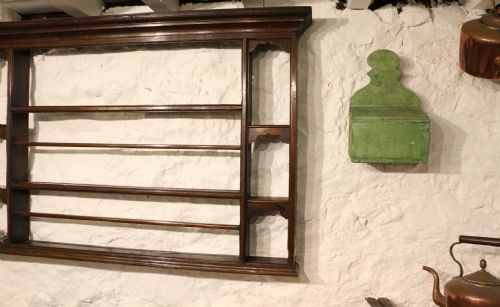 ONCE A MAINSTAY OF THE HEARTHSIDE IN DOMESTIC SETTINGS FOR SHOW AS WELL AS FUNCTIONALITY- A LOT OF LOVE AND EFFORT GONE INTO THESE PIECES. 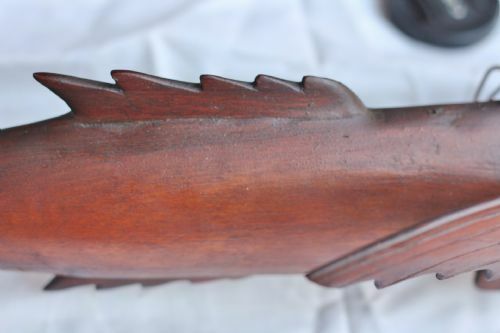 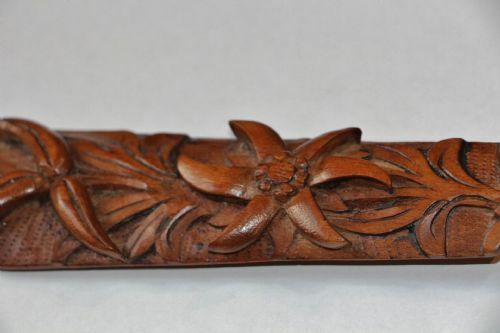 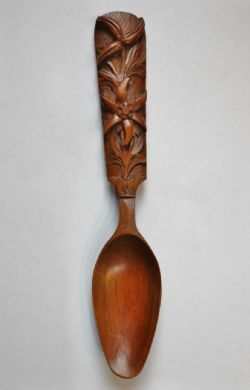 A GOOD FLATBACK STYLE CARVED CONTINENTAL LOVESPOON WITH DEEP RELIEF CARVED FLORAL DESIGN, DEEP ELONGATED BOWL, NICE RICH COLOUR FRUITWOOD & DENSE GRAIN. A FINELY CARVED FLATBACK STYLE LOVESPOON WITH RELIEF FLORAL OF DAFFODILS AND WILD ROSE DESIGN AND DEEP SHAPED DISH, LOVELY DENSE NUTTY BROWN GRAIN AND COLOUR. 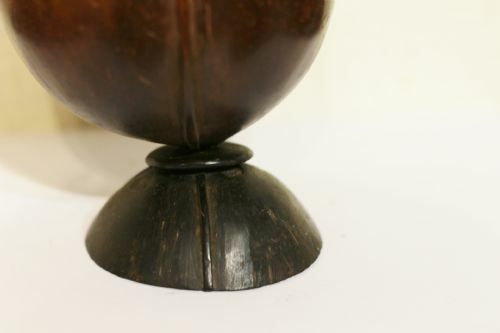 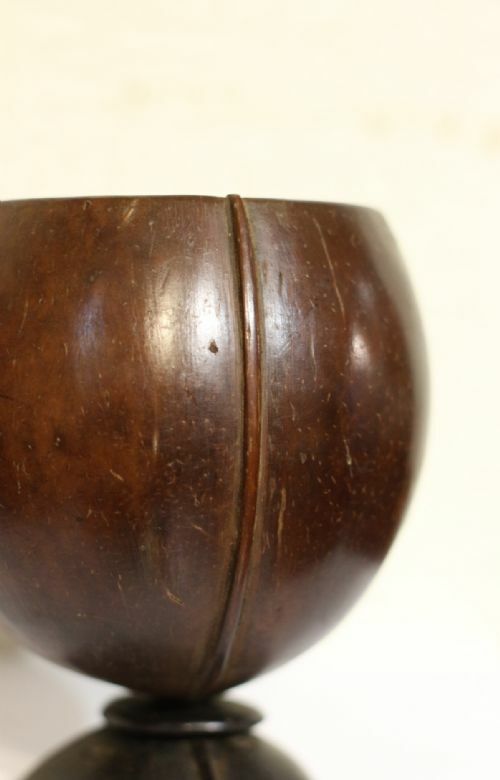 A RELIEF CARVED COCONUT DRINKING VESSEL OF PRIMITIVE FORM, CARVED OF THREE PIECES , LOVELY DARK POLISHED PATINATION, FIXED WITH BRASS INSET SCREW.IN ORIGINAL UNTOUCHED CONDITION. 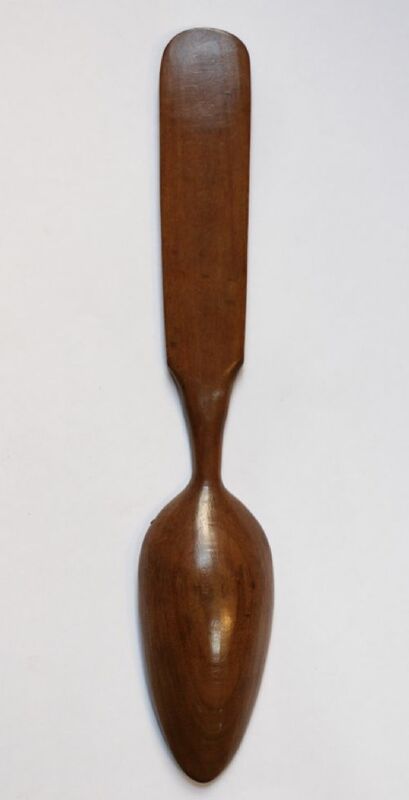 PIECES LIKE THIS WERE SOMETIMES BROUGHT BACK BY MARINERS AS FUNCTIONAL NOVELTY GIFTS AFTER TRAVELLING ON VOYAGES OVERSEAS .BOUGHT PRIVATELY. A LATE 19TH/ EARLY EDWARDIAN POLYCHROME PAINTED IRISH WALL CANDLE BOX, WITH SHAPED BACK AND HINGED LIFT UP LID, SEVERAL LAYERS OF PAINT TO SURFACE, VARIOUS HOLES TO REAR FOR FIXING IN ITS TIME. 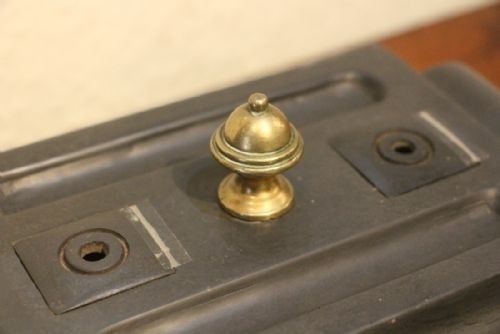 FROM A PRIVATE COLLECTION.